In my quest to talk with a variety of people about cosplay, I wondered into the streets of downtown Atlanta. The whole area was crazily packed with all sorts of people, both cosplayers and non-cosplayers alike. Even as the temperature continued to go up (it -is- Atlanta in the summertime, after all), it was obvious that people were still having a lot of fun. At one point, I saw that there that a guy dressed in a rooster head and carrying a bat around. Even for DragonCon, it was a bit different. So I first introduced myself to him and then began to talk with him briefly about his cosplay. 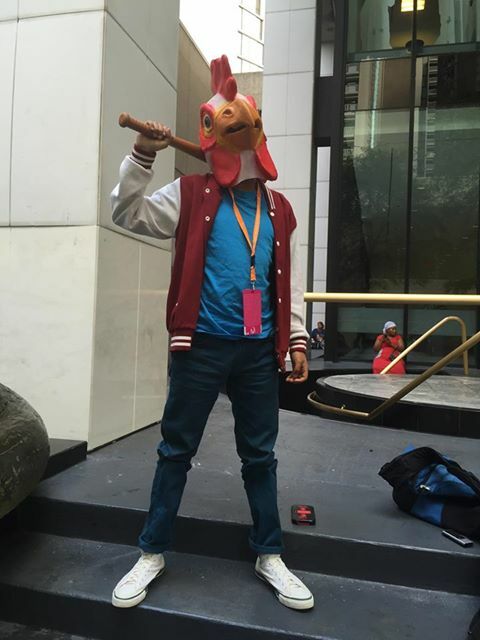 Ricardo cosplaying as Jacket from the video game Hotline Miami at DragonCon 2015. Ricardo A*****, from Atlanta, Georgia. Who are you cosplaying as today? 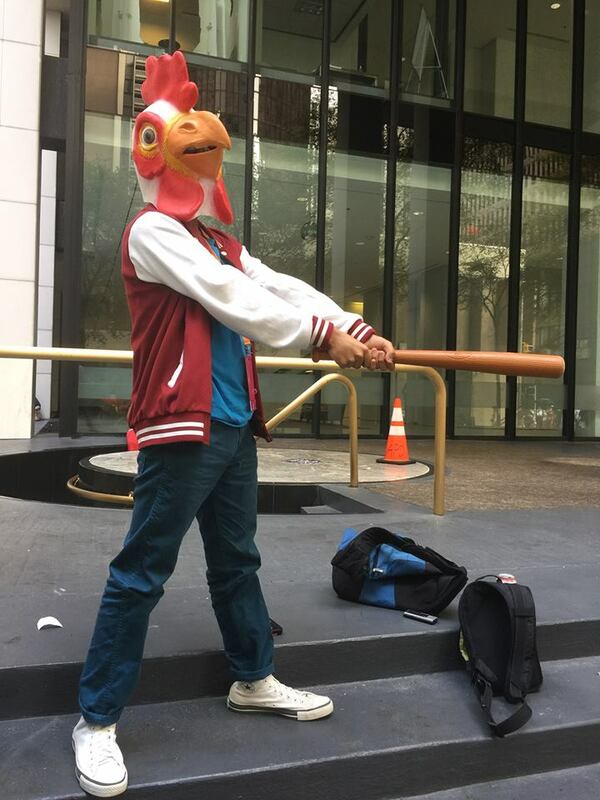 I’m cosplaying as Jacket from the game Hotline Miami. How long have you been cosplaying for? I’ve only been cosplaying since about the past year or so, since about 2014. What got you into cosplaying? Well, I see all these people at cons always cosplaying and I’m just like “I want to be like them, so why not?”. Why did you pick this cosplay? Because this is a character that was [an] easy design [to] get the stuff for and anyone can cosplay him. I’m not that good at making cosplay, so that’s why I chose this one. I see you’ve got a mask, so I’m assuming you didn’t make the mask. No, I bought it online. Did you get the clothing from stores as well? Ricardo cosplaying as Jacket and posing with his weapon of choice. What other cosplay have you done before? I’ve done Delsin Rowe from InFamous [Second Son] and I’ve also done Jake English from Homestuck. And that’s it. Do you go to other conventions besides DragonCon? I’ve only been to two others besides this one, since I’ve only been going recently. I went to Anime Weekend Atlanta last year and MomoCon earlier this year. What cosplay are you looking forward to doing in the future? I’m planning on doing Constantine from Hellboy comics and Hawkeye from Avengers. Why do you want to do those particular characters? I just really like their outfits and it’d be fun to cosplay as them. Going back a little bit earlier: You mentioned that you like cosplay because it looks fun to do, and you wanted to be like other people. Correct? Is there any cosplay that makes you go “Wow, I really want to do that or I really want to attempt that”? Well, when I see people with Star Wars cosplay on, [with] all the make up, the outfits, the lightsabers…that is what I want to do. That really interests me a lot. Is there anything else that I haven’t asked you that you’d like to say? This is Part Three of a five-part series about cosplay at DragonCon 2015. Part Four will post tomorrow (September 17th, 2015) at 2 P.M. Pacific Time.